NASA will try again early Tuesday (March 27) in an effort to launch five suborbital sounding rockets on a mission to study high-level jet stream winds by creating artificial glowing clouds near the edge of space. After several delays, the rockets are scheduled to blast off from launch pads in Virginia between 2 a.m. and 5 a.m. EDT (0600 and 0900 GMT). If all goes well, each of the five unmanned rockets will release a chemical tracer into the jet stream winds more than 60 miles up that should create brilliant milky white trails in the nighttime sky to enable scientists and people on the United States East Coast to actually "see" these high-altitude winds at the edge of space, NASA officials have said. The glowing clouds created in the experiment may also be visible to skywatchers along the U.S. East Coast, local weather permitting. But while the latest weather forecasts appear to be favorable with clear weather forecast along the Atlantic Seaboard, another meteorological condition – gusty winds – could ground the rockets for yet another night. The mission, which is called the Anomalous Transport Rocket Experiment, or ATREX for short, has been on hold since the night of the first launch attempt on March 15. In addition to the launch site, NASA has also set up cameras to photograph the rockets' luminous vapor trails from two locations: the Rutgers Marine Field Station in Tuckerton, N.J., and the U.S. Army Corps of Engineers at Duck, N.C. Clear skies at all three locations are essential in order for the rockets to be launched. NASA updates on the mission are also available via Twitter @NASA_Wallopsand on the launch center's Facebook page. On Thursday (March 22), mission scientists looked like they were finally going to get their chance to launch, with mainly clear skies and only a few scattered high clouds at the North Carolina viewing site. The three-hour launch window was set to open at midnight EDT (0400 GMT), but as countdown clocks ticked closer to the scheduled opening of the launch window, patchy areas of low clouds as well as fog began to creep into Wallops Island and Tuckerton, N.J. Occasional gusty winds at the launch site also posed a problem. When the launch window opened at midnight, early Friday morning, the five sounding rockets were still on their respective launch pads. NASA continued to watch the weather, hoping that clearer skies might evolve as the night progressed, but in his periodic briefings, NASA's weather officer could only report that local conditions were in fact, slowly worsening. 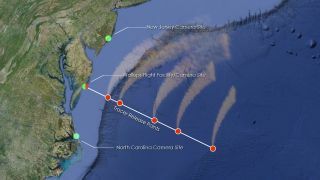 To add to NASA’s problems, it was discovered that three boats had apparently wandered into the restricted zone, located immediately offshore from the Virginia launch site. Two of the boats immediately moved out, but the last boater refused to leave the restricted waters which are potentially dangerous because the rockets could land there. At 1:30 a.m. EDT (0530 GMT) this morning, it was determined that it would take a minimum of one hour to move the final boat out of the restricted area. With low clouds and fog continuing to close in at both Wallops Island and Tuckerton, the decision was made a minute later to scrub the mission for the night. So NASA managers have now decided to wait until no earlier than 2 a.m. EDT (0600 GMT) on Tuesday in hopes that the expected strong winds will either have abated or at least diminished enough to allow for a launch. The launch window will remain open for three hours. If the launch is held over until Tuesday night/Wednesday morning the forecast show that the wind will have switched direction and blow much lighter – south-southwest at only around 5 mph. But there will then be a concern about a swath of mid-to-high level clouds that could drift in from the west by launch time. On Wednesday morning the window is scheduled to open at 12:17 a.m. EDT and will close at 4:55 a.m. EDT (0417 to 0855 GMT). The ATREX mission — when it finally launches — will provide an interesting sky show that might puzzle and amaze unsuspecting viewers along the United States East Coast, from central New England to South Carolina, and as far west as West Virginia. Each rocket will eject a chemical tracer, called trimethyl aluminum (TMA), which will be illuminated at high altitudes by the sun (which will be below the local horizon at ground level). Initially, the cloud trails — seven in all — are expected to glow in reddish hues, and then quickly turn to white. They could persist in the sky for possibly as long as 20 minutes before fading completely away. The launch window runs from midnight to 3 a.m. EDT (0400 to 0700 GMT). Photographs of four trimethyl aluminum (TMA) trails released from rockets flown from Poker Flat, Alaska, in February 2009. TMA is chemiluminescent when exposed to oxygen in the atmosphere and can be seen with the naked eye or tracked with cameras. The trails are initially straight but are distorted by the wind shears and turbulence that occur naturally in the atmosphere. Trimethyl aluminum is an organometallic compound that is liquid at room temperature. Though nontoxic, TMA is dangerous because it can ignite spontaneously. In rockets, the chemical is kept under pressure. At the very low pressures of the Earth’s upper atmosphere, some of the released TMA evaporates, but the rest freezes into solid particles. At an altitude of roughly 62 miles (100 kilometers), heating by friction causes further evaporation, and the particles shine in part by a chemiluminous process. In several cases, bluish-white cloud "puffs" will be created, resulting from the chemical reaction of TMA with atomic oxygen in the atmosphere, producing the molecule AlO. While NASA's ATREX launch will occur in the middle of the night, at the high altitude where the TMA will be released, it will be directly illuminated by sunlight, which will excite the molecules causing them to glow. Using time-lapse photography from the New Jersey and North Carolina sites, the drift of the cloud trails can be accurately determined, which indicate the direction and speed of the winds at these high altitudes. Such winds continually transfer heat and matter from the Earth’s sunlit hemisphere around to its dark side. In addition, the rate of diffusion of the trails will give scientists an idea of how fast the TMA that was deposited will disappear. The rate of diffusion is inversely proportional to the density of the air which decreases in height. With this in mind, the cloud trails and puffs that are released at higher altitudes will likely appear wider and larger, and should expand much faster than those trails that are released at lower altitudes.